Our Karate teacher's teachers from Okinawa brought their friendship, lifestyle, culture and Martial Arts (Ryukyu weaponry, To-de fighting and survival-skills, that were taught in secret 1609-1895 during the Satsuma invasion) to Doshisha University Karatedo Club Japan. So, the Karatedo of our Kofukan International organization is the traditional Karatedo of the Doshisha University, an original birthplace of Karatedo in Japan. Master Miyagi & Master Mabuni mainly taught Master Higaonna's Naha-te and Aragaki and chinese methods from Gokenki. Many years later (after Master Miyagi's return to Okinawa), Master Mabuni kept teaching Master Higaonna's Naha-te but later as well his Master Itosu's Shuri-te, Tomari-te, Kiyan, Aragaki and other methods of Shito-ryu such as Matsumora and chinese methods. Chojiro Tani learnt all of that and he taught Shito-ryu (Higaonna's Naha-te, Itosu's Shuri-te, Tomari-te, Aragaki and more from Miyagi's & Mabuni's teachers). Master Kenwa Mabuni then authorized Chojiro Tani to develop his own style "Tani-ha Shito-ryu" and he called his organization "Shukokai". To establish his own dojo "Tani-ha Shito-ryu Kempo Karatedo Shukokai Honbu Dojo" he moved to Kobe, from where Tani got world-renowned. 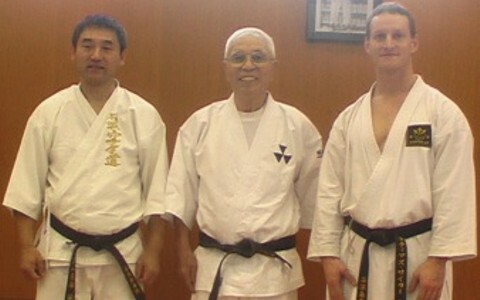 Master Fujimoto's background is Higaonna's Naha-te (Goju-ryu, hard-soft) together with Itosu's Shuri-te (Shito-ryu as above) Aragaki, Uechi-, Motobu-ryu and Karate Jutsu from Seijiro Sakihama (Jugoshizen-ryu, soft-hard). 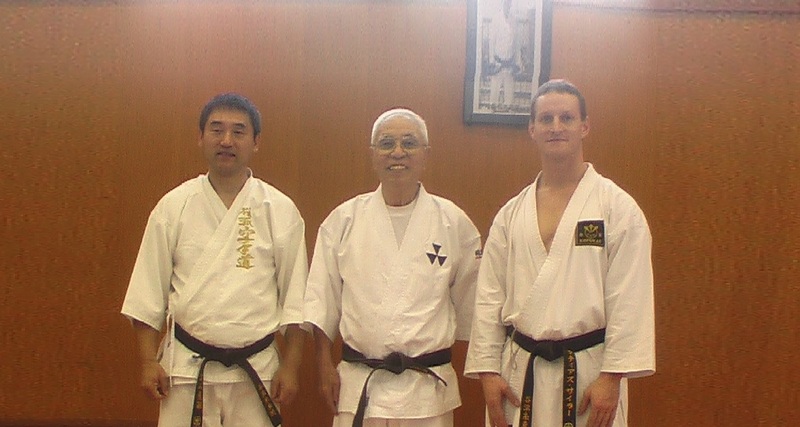 Master Tomiyama & Master Omi, Joint Chief Instructors of Kofukan International, are both graduates of Doshisha University, "Doshisha Karatedo Old-Boys" of the Doshisha Karatedo Club (since 1935) and teach the traditional Karatedo of their direct teachers. Master Tomiyama of Kofukan International has a strong background is Naha-te (6th Dan Goju-ryu), Shuri-te & Tomari-te (8th Dan Shito-ryu), Uechi-ryu and Karate Jutsu "Jugoshizen-ryu" from Master Fujimoto. other methods, Katas Heiku, Peiku, Pachu, as well Ahnan, Chatanyara, etc.. Since 1999 (1999, 2007, 2012, 2015, 2017, 2019), students from Switzerland regularly visit Doshisha University Karatedo Club Kyoto for trainings, where as well our own teachers teach and have learnt our traditional Karatedo themselves. Doshisha University Karatedo Club has more than 300+ Senior Karateka who have learnt Karatedo from these teachers above, Chojun Miyagi and Kenwa Mabuni, in the years 1920 and later. They're called "Doshisha Oldboys". The Doshisha Oldboys celebrated their 80th Anniversary of Doshisha University Karatedo Club in 2017 in Kyoto, where we enjoyed to attend the awesome Anniversary celebrations with festivities. It's a unique pleasure to regularly train with the Doshisha Oldboys at Doshisha University Karatedo Club, to feel their original Karate Jutsu and Budo spirit, friendship, see their good health, their youth at advanced age and to keep that unique treasure alive. During the "Satsuma invasion" (1609-1895) all Ryukyu islands including Okinawa were occupied and weapons were banned for the local population. To survive the occupation, the "To-te" fighting- & survival-skills were used and taught in secret in the Okinawan villages Naha (Naha-te style), Shuri (Shuri-te) and Tomari (Tomari-te), and "Ryukyu weaponry" (Nunchaku, Tonfa, Sai, Bo, Jo, etc.) were invented. Before coming to the Doshisha University Kyoto, our Karate teacher's teachers from Okinawa, Master Chojun Miyagi and Kenwa Mabuni, learnt the Okinawan Martial Arts and weapon skills and fighting methods from their teachers Master Kanryo Higaonna, Master Aragaki, Ryu Ryu Ko and others. Around 1900, after the occupation, these Okinawan Martial Arts were brought to Japan, mostly Universities in Osaka area (Osaka and Kyoto) and Tokyo area. This is how it started at the Doshisha University in Kyoto, where our teachers studied and learnt Karatedo. "To-de", "the Fist from the South", named after their villages of origin, e.g. or named after its Chinese Style, e.g. Kaku-ken as White Crane method (Kaku-ho group of katas named after one of the five animals of which fighing styles where created). Chojun Miyagi was in the Army, well known as martial artist. To teach the police, he became a Police Instructor. To maintain independency as a Police Instructor, Miyagi had to move his homebase regularly. That's why Master Miyagi came to Japan at the beginning of the last century. Chojun Miyagi brought his Ryukyu Kempo from Okinawa island to Osaka area and started teaching at Doshisha University in Japan. So, Doshisha University is considered to be a birthplace of Karatedo in Japan. Kenwa Mabuni from Okinawa island, a good friend of Police Instructor Chojun Miyagi, as well learnt fighting methods, and was trained by Master Kanryo Higaonna, Master Anko Itosu, Master Aragaki and Ryu Ryu Ko. 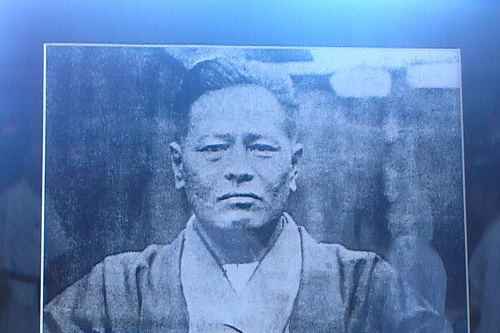 When Chojun Miyagi started his Police Service in Japan, Kenwa Mabuni also followed Chojun Miyagi to Osaka/Kyoto area and helped him teaching Naha-te at Doshisha University. When Chojun Miyagi's service in Japan ended, Miyagi and Mabuni both agreed that Kenwa Mabuni stayed in Japan to keep teaching Naha-te at Doshisha University. 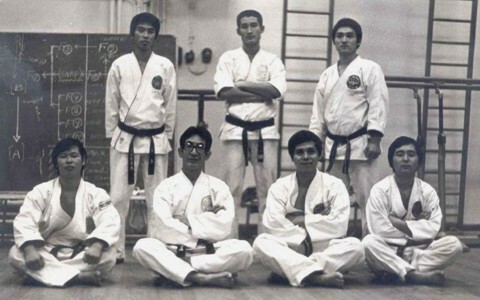 At that time, most of today's "Doshisha Oldboys" were young students at the University and started learning Karatedo by learning Higaonna's Naha-te directly from Master Kenwa Mabuni. At that time, Kenwa Mabuni did not yet create "Shito-ryu". Kenwa Mabuni taught mostly "Naha-te" at Doshisha (later, after Miyagi founded "Goju-ryu", Mabuni called his Naha-te "Hankyo-ryu", later "Mabuni Goju-ryu") and many years later started to teach Itosu's Shuri-te, Tomari-te and Kobudo at Doshisha as well. Some of his young students were Chojiro Tani, Hiroshi Fujimoto, Sakamoto and many more. As I said, still today there are more than 300+ Karateka at Doshisha University Karatedo Club called "Doshisha Oldboys" who have learnt Karatedo from these teachers. Our Karate Masters & close friends Master Chojun Miyagi, Kenwa Mabuni, Chojiro Tani, Hiroshi Fujimoto, all the "Doshisha Oldboys", Keiji Tomiyama, Naoki Omi and many more still come together to train Karatedo, for their whole life now, from the beginning of their studies until today, at Doshisha Karatedo Club in Japan. Their good health, active friendship, open heart and happiness is very obvious in this unique Karatedo-family. They meet whenever they can. Kofukan International association of Master Okubo, Omi & Tomiyama is our worldwide Karatedo organization. Our teachers are all gradutates of Doshisha University and our teachers are "Doshisha Oldboys". 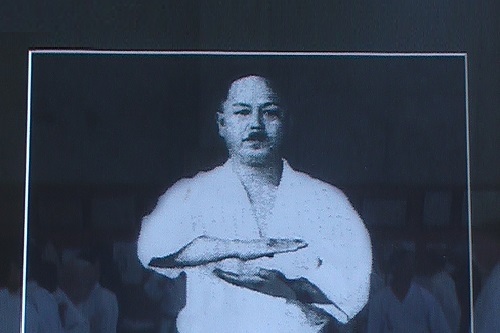 As long as Master Chojiro Tani was alive, Kofukan was as well official representant of "Tani-ha Shito-ryu Kempo Karate-do Shukokai" of founder Chojiro Tani, who learnt Higaonna's Naha-te, Itosu's Shuri-te, Tomari-te & other methods and Kobudo from Master Kenwa Mabuni. That's why we learn, study and practice these specific Karatedo methods, styles & Katas of Naha-te, Shuri-te, Tomari-te, Aragaki, Matsumora, Kiyan, Uechi and other methods from our direct teachers Chojun Miyagi (Goju-ryu), Kenwa Mabuni (Shito-ryu), Chojiro Tani (Tani-ha Shito-ryu), Master Fujimoto (Master of Goju-, Uechi-, Shito- and Ju-Go-Shizen-ryu).